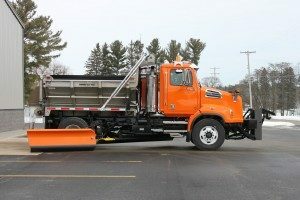 The Alcona County Road Commission recently added two new single-axle trucks to its fleet and both trucks have been retrofitted with dump boxes from two retired trucks. “Several years ago, the decision was made to install stainless steel dump boxes on trucks in the Road Commission’s fleet because they are durable and can better withstand the rigors that come with road maintenance,” says Road Commission Manager Jesse Campbell. “It was a good call because this is the third chassis one of the boxes has been on.” The other box, Campbell explains, was salvaged from a chassis that was damaged by fire caused by an electrical malfunction on a jobsite. While the initial investment in stainless steel boxes is about 20 percent higher than the cost of regular steel boxes, it is evident that over time the stainless steel is the better value. The two Western Star trucks were purchased from Grand Traverse Diesel in Traverse City at a cost of $108,160 each. The used boxes have proven useful over the years with a conveyor bottom type material spreading system that works equally well for summer and winter applications. Both trucks are equipped with a wing attachment for additional efficiency for winter maintenance. The trucks are already in service. One has been assigned to the Harrisville Township route and the other to the west Hubbard Lake route.